Officially opened in 2014, the H.M.S. Tecumseth Centre is an exciting addition to Discovery Harbour and is included with regular site admission. The dynamic H.M.S. 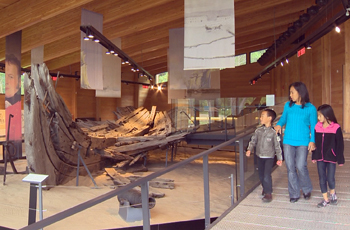 Tecumseth Centre offers visitors a world-class facility that showcases the original 1815 hull of H.M.S. Tecumseth. The original hull was pulled from Penetanguishene Bay in 1953 but has not had a climate controlled permanent home until now. Exciting new exhibits surrounding the history of the Penetanguishene Naval Establishment are part of the visitor experience in the H.M.S. Tecumseth Centre. Numerous artifacts from the site’s 19th century history are on display, including the original 1815 clear-glass deck lights from H.M.S. Tecumseth plus a wide array of intriguing items including a powder flask, period coins, a brass platter stamped with the King’s mark, compasses, a carronade, a ship’s anchor, and even a rum bottle and flask. Key historical personalities associated with the site’s history are also explored, including Naval Hydrographer Henry Bayfield, Captain Samuel Roberts, and Chief Tecumseh. The exhibit was funded in part by the Minister of Canadian Heritage and Official Languages, 1812 Commemoration Fund.